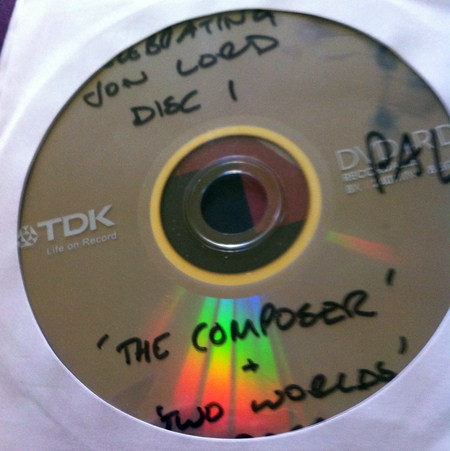 Last night, conductor Paul Mann sat down to watch a pre-release copy of the full film from Celebrating Jon Lord last April at Royal Albert Hall. That’s Paul’s disc in the photo. ‘While I was supposed to be signing things yesterday, I took four hours off to watch advance copies of the two concert films and the documentary. The director, Tim Sidwell, and his production company Toward Infinity has done a truly magnificent job, full of the kind of imagination and flair and sensitivity that Jon would have absolutely loved. For me, watching it all back was like waking up from a dream only to discover it was real. Too many highlights to mention, but I was astonished by Burn, which is just insanely, recklessly energetic, with stunning drumming from Ian and a scorching arrangement by my dear old pal Richard Whilds. The signatures mentioned by Paul are copies of Jon’s original handwritten manuscript for Sarabande, which will be included in the box set edition of Celebrating Jon Lord. Pre-order links below.